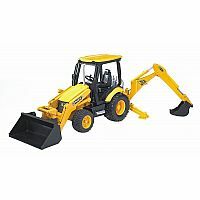 This JCB MIDI CX Backhoe Loader is made just like the real thing. The frontloading arm has a grip for steering and a locking mechanism in the upper position. The frontloading shovel has 2 positions for loading and unloading. The driver’s seat swivels to allow for the operation of the backhoe. The backhoe has fold-down support legs and is also detachable. The backhoe loading arm is able to excavate below ground level and the scoop steering can be operated using one hand. 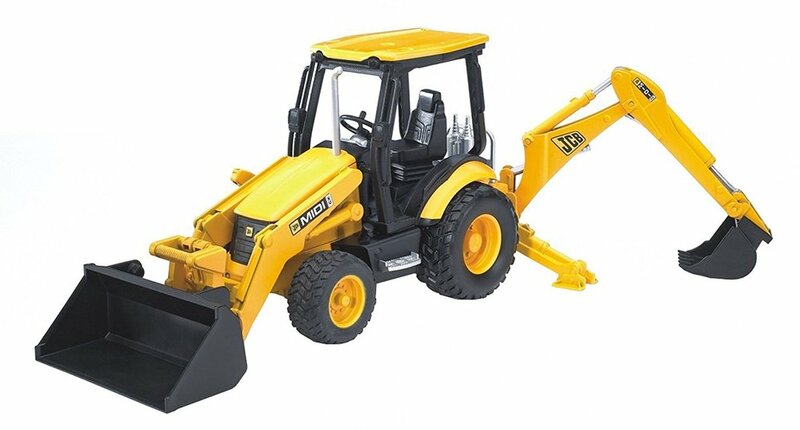 The front loader and backhoe loader scoops are both changeable. The standard tractor coupling, which is included, can be mounted when the backhoe loading unit has been removed; this allows all trailers and farming equipment available to be used. The soft rubber tires have real treads.